Pomegranates are a sure sign that Rosh Hashanah is here! This is such a beautiful season, a time of renewal with a fresh year ahead. 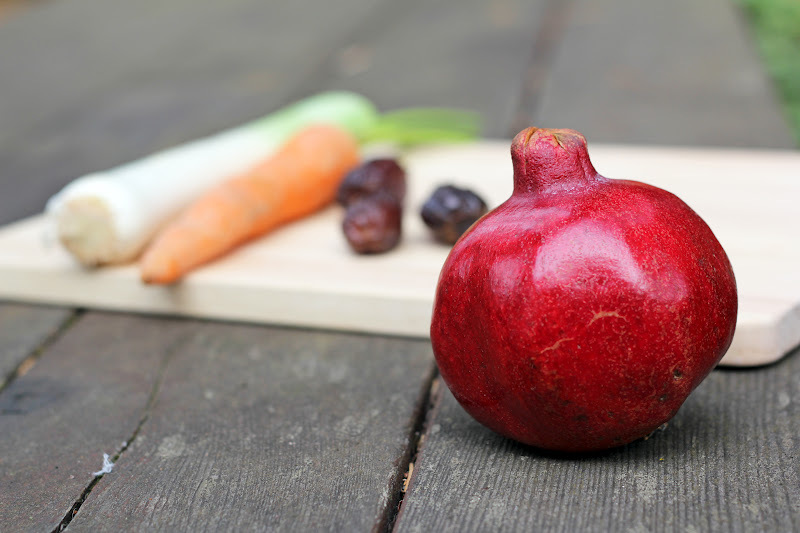 We eat pomegranates during Rosh Hashanah with the wish that our good deeds in the coming year will be as abundant as the seeds of a pomegranate. And they taste so good, too! 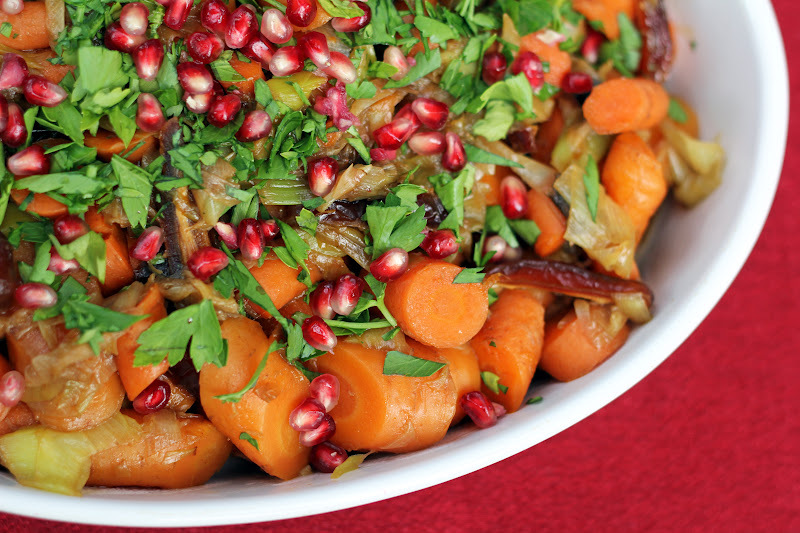 Our new year will begin with a meal of round challahs filled with chocolate and figs, brisket, maple sweet potatoes, jujubes (a new fruit we just discovered at the farmer’s market), apple honey cake and this side dish of Pomegranate Glazed Carrots and Leeks. Sweet carrots and caramelized leeks are glazed with a mix of pomegranate molasses and honey. Pomegranate molasses is wonderfully tart, and I added a drizzle of honey to balance it out. I couldn’t resist tossing in some sliced dates, and a sprinkling of crimson pomegranate seeds added a pop of color. Filled with fall flavors, it is a delightful dish. I look forward to gathering around the table with family and friends and dipping apples in honey. These are special days to savor; crisp, sunny days with leaves blushing the color of pomegranates – for that, and for so much more, I am grateful. L’shana tova – a sweet and happy new year to you! It was indeed tart and sweet, Eileen - and I found it to be even better the next day after the flavors married for a bit. L'shana tova to you and your family, Hannah! 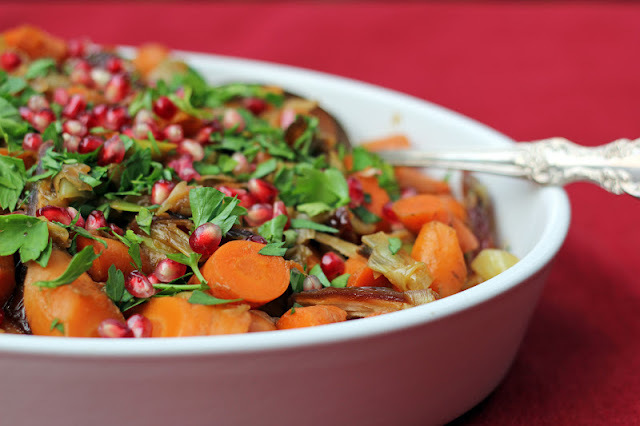 I love pomegranate molasses, and this combo with carrots sounds just great!! Thank you, Susan! The year is off to a beautiful beginning. Isn't pomegranate molasses the best? I'm always looking for more ways to enjoy it. Adore pomegranate seeds! Trader Joes actually sells them already seeded from the fruit. It's a little expensive, and a little silly if you ask me, but sometimes handy in a pinch! Hi Hannah - it is Bev. What a great use of pomegranates. They are one of my favourite foods and remind me of little jewels scattered through the meal. I will be in Turkey in a couple of weeks and am so looking forward to the fresh pomegranate juice you can buy on the streets just about anywhere. Thanks for the inspiration. Enjoy! Hi Bev! Pomegranate seeds are indeed lovely jewels. They brighten up dishes so nicely! Wow, on to Turkey now. Have a glass of pomegranate juice for me - that sounds divine. Safe travels to you! Hi Hannah! Shana Tova! I love this idea - I might make it this weekend (for our delayed New Year's gathering) but in any case, I love the pomegranate seeds and the symbol of the seeds reflecting our many good deeds. I think I am going to put some of them into a bulgur dish I am making - the taste and color should be a perfect add! Wishing you and your family a sweet new year ahead, Beth! Your bulgur dish sounds terrific - I hope you share the recipe. Enjoy your Rosh Hashanah celebration this weekend! Thank you, Mairi! I appreciate your kind words. It's fun sharing about holidays and traditions. Nothing sweeter than joining with family and friends to celebrate and eat together! Thank you so much, Katherine! Wishing you a sweet year ahead, too! Thank you, I appreciate you saying so!